Cooking at Bonanza Farms with TKidsT! 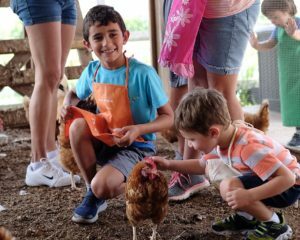 This past month, our TKidsT families as well as other children who joined us, had an unforgettable experience at our latest event, Cooking at Bonanza Farms! Our cooking groups have been motivating our children and have also been hands on in helping them learn and practice so many different skills all while having what’s most important, FUN! We decided to repeat this event because have this unique cooking experience at a farm helps create picture-perfect memories with parents and friends. Bonanza Farm is a magical place for our children as there are a host of things to see and do! The children enjoyed the variety of animals such as horses, ponies, rabbits, goats, hens and who could forget Nati, their charming doe. Being out in the open nature, having all the animals around, the kids were fascinated beyond belief. From playing with friends at the playground to participating in a hands-on cooking experience, the children did not even notice their actions were developing their language and listening skills! They were following steps and learning to wait and take turns. They also were able to explore their senses by using their bare hands while making Argentinian empanadas, touching hens, holding eggs used during cooking as well as smelling and tasting the empanadas and cookies! At the end of the cooking event at Bonanza Farm, the children appreciated their unique experience that allowed them to PLAY but most importantly improve their social interactions and develop their self-confidence and price. Truly a great day!